(CNN) -- Illinois Gov. Rod Blagojevich is in federal custody on corruption charges, a law enforcement official said Tuesday. Rod Blagojevich is currently serving his second term as governor of Illinois. Blagojevich and his chief of staff, John Harris, are charged with conspiracy to commit mail and wire fraud and solicitation of bribery, according to a statement from the U.S. Attorney's office for the Northern District of Illinois. Both men are expected in U.S. District Court in Chicago later Tuesday. A news conference is expected at noon ET. Federal prosecutors say Blagojevich, Harris and others conspired to gain financial benefits in appointing President-elect Barack Obama's Senate replacement, according to the statement. "The breadth of corruption laid out in these charges is staggering," U.S. Attorney Patrick Fitzgerald said in a statement. "They allege that Blagojevich put a 'for sale' sign on the naming of a United States Senator; involved himself personally in pay-to-play schemes with the urgency of a salesman meeting his annual sales target; and corruptly used his office in an effort to trample editorial voices of criticism." The Obama transition team is aware that Blagojevich is in federal custody, but has no comment, according to a senior Democratic source. The statement also alleges that Blagojevich and others tried to illegally obtain campaign contributions. Blagojevich, Harris and others are also alleged to have withheld state assistance to the Tribune Company in connection with the sale of Wrigley Field. The statement says this was done to induce the firing of Chicago Tribune editorial board members who were critical of Blagojevich. Blagojevich, who turns 52 on Wednesday, is in his second four-year term as Illinois governor. His term ends in January 2011. Before being elected governor, he served as a U.S. congressman for Illinois' 5th district from 1997 until 2003, according to his online biography. He and his wife, Patti, have two daughters. 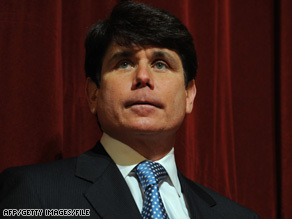 Blagojevich announced last month that he was forming a panel to review candidates to fill Obama's Senate seat. Several Illinois Democrats -- including Rep. Jesse Jackson Jr. and Iraq war veteran Tammy Duckworth, a former congressional candidate who now serves in Blagojevich's administration -- have been mentioned as possible Senate replacements for Obama.